Ok so I talked about Benefit's new Crescent row Collection a while ago, and how I loved the bottles and how I was excited to try! Inspired by a visit to the Royal Crescent, a spectacular example of Georgian architecture of a row of townhouses laid out in a semi-circle in the town of Bath, the new collection is called Crescent Row and features three feminine scents corresponding to three different flats: Laugh with Me LeeLee, Something about Sofia, My Place or Yours Gina .. 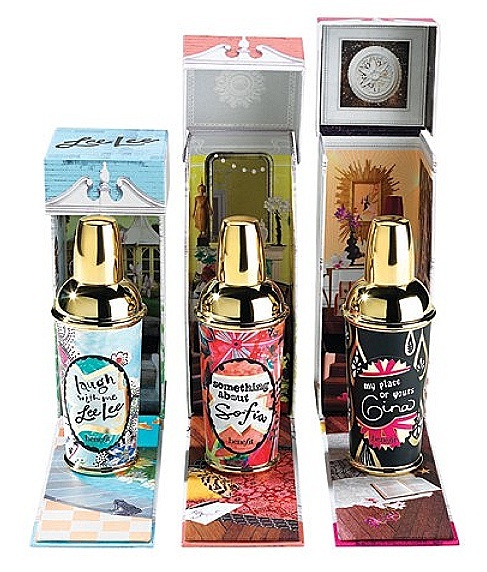 While strolling the aisles of Ulta 3, checking out the new perfumes and fragrances, I came across the Crescent row perfume, and I sprayed each one on little testers to figure out if i liked or disliked. My end result? I really dislike them all. The smells are very generic, and nothing really special. However the Eva is my favorite. Smells very citrus and fruity, which are my favorite scents. This is the one I would pick if I had to purchase, but after smelling them all, the best thing about the scents are the bottles.